HÉLÈNE TYSMAN, the young French pianist who has been hailed by London’s Daily Telegraph as “poetic” will give 2 concerts at Os Agostos during April. The first, on Tuesday April 17, 2018, will feature works by Bach and Debussy. The second concert will take place on Thursday April 19 and Hélène will play music by Chopin and Ravel. Hélène was born in Paris and began her piano studies at the Paris Conservatoire under Pierre-Laurent Aimard and later in Vienna with Oleg Maisenberg. She obtained her master’s at Hochschule für Musik Franz Liszt, Weimar. Since becoming a laureate of the 16th International Chopin Competition in Warsaw, Hélène has emerged as one of the leading French pianists of her generation. Hélène has given numerous recitals throughout Europe, Asia and the USA and has performed with the BBC National Orchestra of Wales, Russian Chamber Philharmonic, Minnesota Orchestra, North Czech Philharmonic and many others. She has toured China where she performed at some of the country’s most prestigious concert halls. 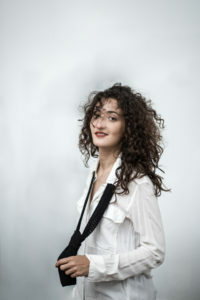 Hélène’s Carnegie Hall debut was made in 2015. Her recital appearances have also taken her throughout Europe and to Israel, Morocco and Russia. She has also been featured on Mezzo, the international arts television station and on French national radio. Her first CD recording was devoted to Chopin. This was after winning the 1st. prize in the International Chopin Piano Competition in Darmstadt. Hélène has since made more Chopin recordings as well as a Schumann CD of chamber music with wind instruments accompaniment. This entry was posted on Thursday, March 15th, 2018 at 11:16 pm	and is filed under Past Concerts. You can follow any responses to this entry through the RSS 2.0 feed. Both comments and pings are currently closed.